Wedding Makeup provided across Nottinghamshire, the East Midlands and the U.K. Undertaken in the first 3 months of the year you are marrying, I tailor this introductory session to the needs of the bride-to-be. The trial will be conducted at my private studio in Southwell, you are more than welcome to bring a friend or family member. The session usually lasts between 2-3 hours. I will want to hear about the theme of the wedding, including the design elements, the style and colour of the dress and hairstyle preferences so that I can guide the bride-to-be towards a look that will suit the overall feel of her wedding. Some clients will have a specific look in mind while others will want to try out different looks for the wedding. I’m happy to cater to a broad range of requests and I will recommend the right products for your desired look. I will explain how the products work to balance, define and lift the face and create a customised colour palette to subtly balance the shapes and shades of the face. The session will also allow us to see how the makeup looks in different lighting conditions and on camera. I will run through the bridal makeup routine so that the client will know exactly what to expect and how much time to allocate for the application. Good bridal makeup should last all day and still look good well into the evening. The pre-wedding session is the ideal opportunity to get to know each other a little and devise that perfect look to make you uniquely beautiful on your special day. I only take on one bridal makeup booking per day, which means that I am there from the moment the big day begins until it is time to walk down the aisle. I understand that you may feel anxious so I never leap straight into action. We’ll have a chat and a cup of tea as I want you to feel at ease before I start to apply your makeup. Each member of the bridal party will be given a time slot for makeup and as the bride your makeup will be finished an hour before you start getting into your dress. This is so you have time before and after to relax, eat, speak to your bridesmaids and enjoy the experience. Each member of the bridal party will be given the option of having cluster lashes applied and given a pot of premium branded lipstick for touch ups. As the bride you will also be supplied with a lip brush to aid application. Due to high demand for my services I have put together some exclusive bridal packages. As I only book one wedding per day you will get my full attention till you’re ready to leave for your ceremony. *Makeup for Bride plus 3 adult bridesmaid’s and/or mums. *Bobbi Brown skin Care applied to each member of the bridal party prior to makeup application & tailored to their skin requirements. I am also happy to help with dress lacing and buttons should you need it. The price includes 30 miles of travel to your venue or home on your wedding day, additional travel is charged at 45p per mile. *Makeup for the bride plus one adult bridesmaid and/or mum. *Application of cluster lashes for Bride and Bridesmaid. I am also happy to help with dress lacing and buttons should you need it, price includes 30 miles travel to your venue or home on your wedding day, additional travel is charged at 45p per mile. *Additional people are charged at £70 Per Person. Due to how busy Summer weekends are with wedding bookings all trials needing on a weekend will be conducted January – March. A week day each each is allocated to trials, for 2019 weddings this is a Tuesday. A small number of Weekend spot through the rest of the year will be reserved for those booking after March. 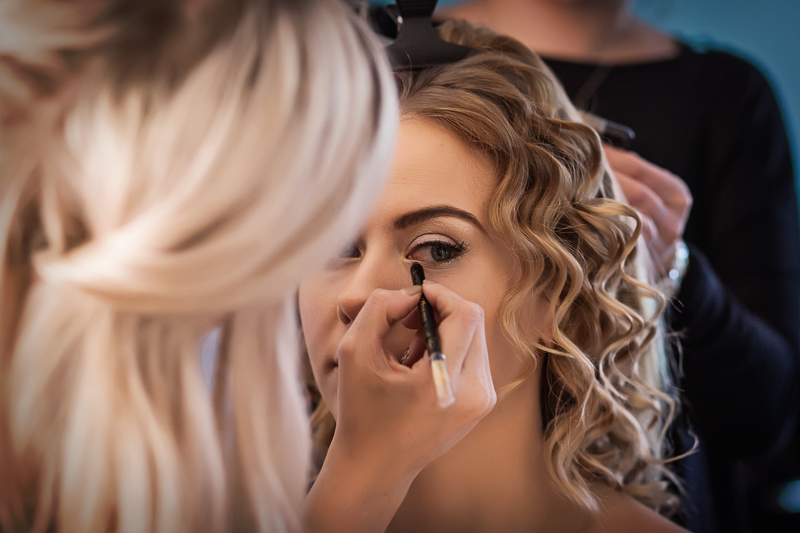 If any of your bridal Party requires a trial, this will be charged at £70 per person and must be carried out at the same time as the bridal trial. If for any reason you would like the trial to take place at an alternative location travel will be charged at 45p per mile (from NG25) and an additional £20 per hour for time lost in the studio. If you would like to book a trial prior to booking your date, these are charged at £100 and you will be given 3 days after the trial to decide if you would like to book. If you move forwards with the booking the £100 will come off your booking fee.